In late 1940, a few British pilots, including Robert Stanford Tuck, demonstrated that British fighters did have the range to conduct attacks on targets or conduct fighter sweeps over Northern France, Belgium and Holland. From the Spring of 1941 to early 1944 the Hornchurch squadrons primary tasks were to conduct seek and destroy missions (Rodeos) Fighter Sweeps (Ramrods) and if the weather was bad small scale attacks on targets of opportunity (Rhubarbs). Collectively these were known as circuses. From 1942, as the allied bomber offensives steadily gained pace with the entry of the United States into the war, Hornchurch Spitfire's were also increasingly called upon to act as escorts for daylight bombers. Fighter sweeps were attempts to tempt Luftwaffe fighters into the air so that they could be destroyed in air to air combat. These sweeps often accompanied bombing raids to tempt German fighters into the air. The seek and destroy missions (Rodeos) and attacks on targets of opportunity (Rhubarbs) were usually conducted “on the deck” at no more than tree top height and comprised gun attacks on airfields, road transport, trains, river traffic, military installations and factories. All were exceedingly dangerous, especially as German air defences and radar improved and to begin with many pilots were lost for apparently little gain. As Hornchurch pilots gained experience and with an ever increasing advantage in numbers, especially after the United States entered the war, the effects of these raids became far more credible. Occasional raids were still made by the Luftwaffe on RAF Hornchurch but from early 1941 the initiative began to shift back towards allied pilots. Even by the end of the Battle of Britain RAF Hornchurch had been home to pilots from many diverse nations, including Americans, Canadians, New Zealanders, South Africans, Belgians, Dutch, French, Poles and Czechs. In the years 1941 – 1944 entire Squadrons made up of some of these nationalities would serve alongside British flyers. The years 1941 to 1944 also saw the creation of the legendary Hornchurch Wing, a combined force of at least three Spitfire Squadrons and often more that would operate together en mass on operations over Europe. Amongst the operations that the Hornchurch wing participated in was the unsuccessful provision of escorts to protect air craft making attacks on the German warships Scharnhorst, Gneisenau and Prinz Eugen during their dash up the channel in February 1942 and the provision of fighter cover for the ill fated Dieppe raid (Operation Jubilee) in August 1942. The Hornchurch Operations centre, now firmly at home in Romford's Masonic Hall, was also made responsible for directing Beaufighters in night interceptions of German raids. During 1943 the air battles over Europe intensified as the allies began their preparations for landing in Northern Europe and by late 1943 Hornchurch Spitfires were intensifying their attacks over northern France to convince the German High Command that any amphibious landing would take place near Calais and not as was planned in Normandy. As the date for D Day approached however, the Hornchurch squadrons were steadily deployed away to forward airfields nearer to the proposed landing beaches. On February 18th 1944 The Hornchurch Operations Centre was stood down and closed. 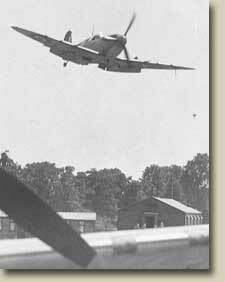 Fighter Operations from RAF Hornchurch had all but ended. During the years 1941 to 1944 Hornchurch pilots claimed 268 German aircraft shot down and 96 others as probable. They also damaged or destroyed many more aircraft on the ground as well as destroying many locomotives, barges, military installations and ground vehicles. In return, however, 126 Hornchurch pilots were killed with many others injured or captured.